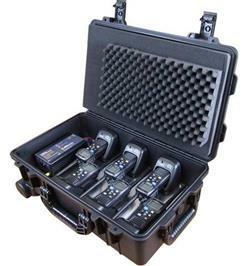 The Icom UK ‘regatta pack’ is a compact/portable support solution, ideal for providing marine communications for RYA and World Sailing affiliated clubs and organisations. Utilising six of Icom’s best selling IC-M73EURO VHF radios, the ‘Regatta Pack’ comes contained in a peli style case together with six integrated fast chargers and power supply. This solution is ideal for any organisation that deals with waterborne activities with enough radios to give to your safety crew, marshals and management team. Before an event, just open the regatta pack up and plug in the mains to charge…it’s that simple and convenient. At the end of the event, just wash the radios down, dry and return to their charging facilities ready to be deployed at your next event. Introducing Icom UK's 'Regatta Pack'. The ‘Regatta Pack’, is a compact/portable marine VHF support solution, ideal for providing marine communications for RYA and World Sailing affiliated clubs and organisations.